Land Tenure Journal - call for submissions! 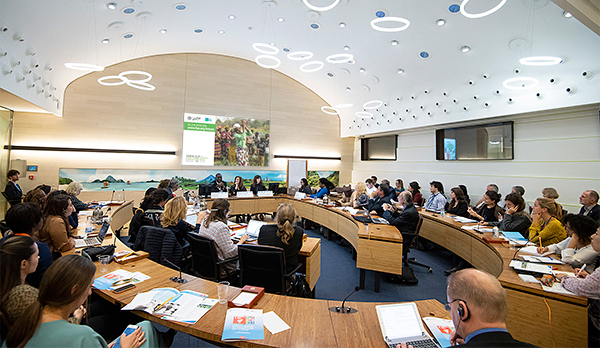 On 16 October 2018, in the framework of CFS45 held at FAO headquarters, the FAO Land Tenure Unit, together with the Social Policies and Rural Institutions Division, organized a side event on advancing women’s land rights. The side event aimed at emphasizing the important role of the VGGT in promoting women’s rights to land and in the eradication of poverty and the achievement of sustainable development. The VGGT are creating spaces for female empowerment, but not only, they are creating a new governance model and developing capacities for people to interact on equal ground. Progress has been made, from changes in land policies and laws to assessing national legislation. In addition, VGGT implementation has promoted dialogue in particularly complex contexts, such as the recognition and protection of women’s rights in customary tenure systems, and have enabled female leaders to know, promote and defend their rights to land and natural resources. During the event, representatives from the Global Land Tool Network, the International Land Coalition and the Albanian Ministry of Justice, and representatives from Sierra Leone and Niger presented the main challenges and achievements in securing these rights. The Western Balkans are among the first countries, where the methodology for the SDGs indicator 5.a.2 has been tested and action plans have been developed to achieve the target. Regional exchanges and sharing good practices motivated governments to undertake legislative actions to strengthen gender equality. Despite some achievements, longstanding customs continue to favor male property ownership and further efforts will be needed by all parties. Presentations highlighted the importance of strong participatory processes that include all relevant stakeholders and capacity building at the local level, both for community women and local authorities and the impact these have had in Niger, Sierra Leone, Uganda and Zambia. Institutions lack sufficient capacity and stakeholders need more support in order to mobilize adequate resources. The main challenge, once improved frameworks are in place, is to enhance the capacity for enforcement. It is important to develop stakeholders’ capacity (particularly CSOs such as farmer associations, women’s organizations, etc.) at local and national level to leverage improved land policies and institutional frameworks to promote/engage in responsible investments in agriculture. Investments in land are fundamental but if not done in a responsible way they may leave people out, especially women. Partnerships are key; for example, universities (i.e. with survey and mapping, and law faculties) can be real drivers of change at local level. Through partnerships with national Civil Society Organizations, efforts at strengthening capacities of CSOs to engage in national processes on tenure-related issues are taking place in over twenty countries. A few suggestions that came out of the event were to improve capacity development, empower women’s groups, enable open source technology and crowd-mapping, and improve dialogue between community and traditional leaders. It is crucial to reach key change agents who can push for women’s land rights within the community, local and national government, (i.e. notaries in the Western Balkans, traditional chiefs). A combination of bottom-up and top-down approach should be considered and appropriate tools that are fit for purpose must be employed. The Second National Land Conference was organised and hosted by the Government of Namibia from 1 to 5 October 2018 in Windhoek, under the theme: “Towards a Comprehensive and Sustainable Land Reform in Namibia”. The Conference was chaired by Dr Saara Kuugongelwa-Amadhila, Prime Minister of the Republic of Namibia, under the High-Level Committee which was comprised of government, civil society, traditional authorities, academia and NGOs. The Conference was officially opened by His Excellency Dr Hage Gottfried Geingob, President of the Republic of Namibia who reiterated the need for open, inclusive and meaningful dialogue on issues that will shape land reform in Namibia going forward. 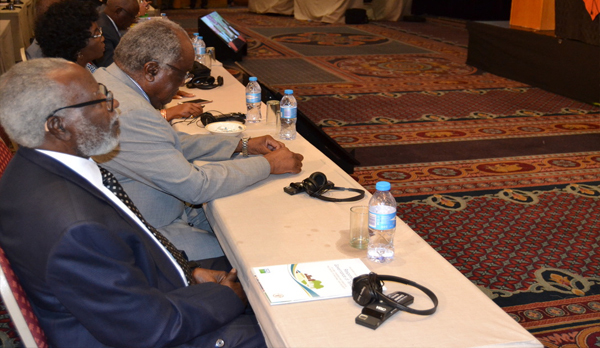 The founding President and former President Dr Sam Nujoma and Dr Hifikepunye Pohamba respectively, also attended the 5-day conference. The Conference was attended by over 800 delegates, from government, civil society, traditional authorities, representatives of marginalised communities, local authorities, regional councils, academia, political parties, workers union and church leaders. The Conference benefited from presentations from invited guests from Zimbabwe, South Africa, Botswana, Nigeria and Cuba, as well as the African Development Bank (AfDB) and the Food and Agriculture Organization of the United Nations (FAO). The FAO presentation, which was cited as giving an international flair to the 5-day landmark Conference, highlighted the relevance of the VGGT and the AU Framework and Guidelines on Land Policy in Africa (F&G) in achieving responsible governance of tenure that is responsive to country contexts. FAO facilitated discussions and provided guidance on effective land administration including land valuation, land taxation, and expropriation. During an interview with the Namibia Broadcasting Corporation, Ms Farayi Zimudzi, FAO Representative, highlighted the bold steps made by the Government of Namibia by bringing all stakeholders to openly debate on the implementation of land reform in an atmosphere of mutual respect allowing for meaningful contributions from all citizens. The Conference aimed at taking stock of the implementation of the resolutions of the 1991 Conference on Land and the Land Question which set the stage for a land reform that has, to date, been inclusive and respects property rights in accordance with the Namibian Constitution. 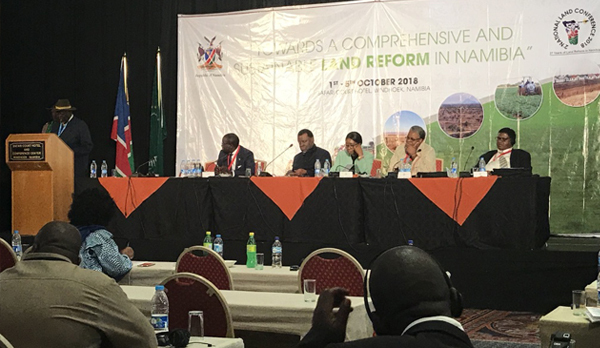 The Ministry of Land Reform, presenting a progress update on the implementation of the 25 resolutions of the 1991 Conference, highlighted challenges that were encountered. The challenges were presented for further deliberations by the Conference. In the spirit of inclusivity, most civil society and traditional authorities were accorded the opportunity to share their views on progress in implementation of the resolutions of the 1991 Land Conference, including the much talked about ancestral land issue. In setting the stage for the resolutions, the Conference underscored the imperative to maintain peace and stability in the country; to recognize unity in diversity; to uphold the Namibian Constitution, especially with regard to property rights; and to ensure dignity and wellbeing in all communities by recognizing their legitimate tenure rights. The Conference came up with 40 resolutions under five thematic areas: commercial land reform and related matters; communal land reform, urban land reform and related matters, land tax & valuation system and related matters and ancestral land rights and restitution. The Conference ended with a government commitment to implement the 40 resolutions in consultation with all citizens. On the side-lines of the Second National Land Conference, FAO engaged the Speaker of Parliament, Prof Peter Katjavivi. The Speaker requested some copies of the Voluntary Guidelines on the Responsible Governance of Tenure of Land, Fisheries and Forests (VGGT) and the African Union Framework and Guidelines on Land Policy in Africa (F&G) to be deposited in the Parliament Library as resource materials for parliamentarians. 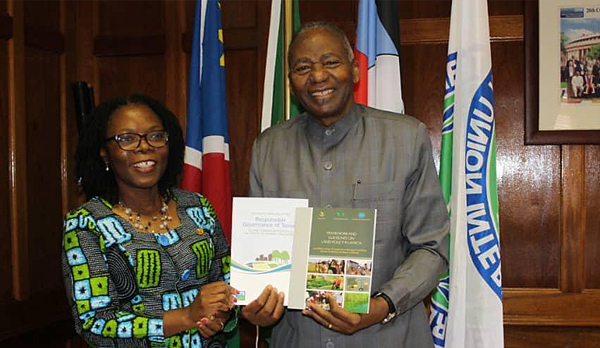 On 5 November 2018, the FAO Representative to Namibia, Ms Farayi Zimudzi handed over copies of the VGGT and F&G to the Namibian Parliament. When handing over the VGGT to the Speaker of Parliament, Ms Zimudzi, emphasized the relevance of the VGGT and the F&G as instruments that will provide guidance to policymakers in development and review of legislation on the governance of tenure. She also indicated that a number of technical guides have been developed to expound on the VGGT and give clarity to their application at country level. When receiving the documents, Prof Katjavivi indicated that the documents will enrich debate in Parliament on matters regarding governance of tenure and more specifically land policy review and implementation. The Speaker of Parliament also took the opportunity to emphasise the role that FAO plays in the country. He highlighted how FAO has provided guidance in a number of areas including commercial and communal land reforms, food and nutrition security, monitoring and review of budget allocations to the agriculture sector in accordance with the Maputo Declaration. He underscored the need to strengthen the working relationship between FAO and Parliament through the various Parliamentary committees. Prof Katjavivi also proposed that FAO could play a facilitator role between the SADC Parliamentary Forum, Inter-Parliamentary Union and the Namibian National Assembly to share experiences on tenure governance and food security issues. The Speaker of Parliament took the opportunity to request FAO’s assistance in raising awareness of the VGGT and the F&G among Parliamentarians and proposed that this be done during the first quarter of 2019. The meeting concluded with the FAOR, Ms Zimudzi reiterating the strategic nature of the partnership between FAO and Parliament and committing to explore ways in which the working relationship could be strengthened. 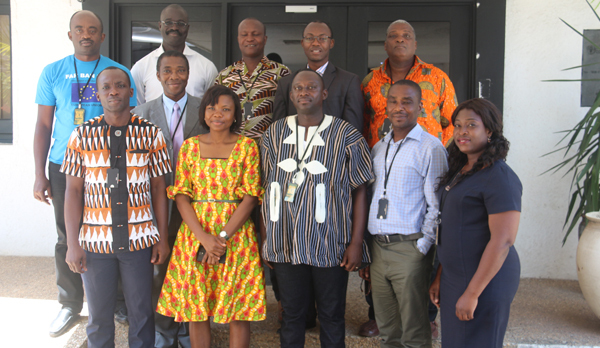 A training workshop was held in Accra, Ghana from 5-6 November 2018 to support the Far Ban Bo (Protecting Fisheries Livelihoods) and Far Dwuma Nkɔdo (Securing Sustainable Fisheries) projects to improve their results frameworks. Both projects seek to improve small scale fisheries management, reduce illegal, unregulated and unreported (IUU) fishing and improve fisheries tenure for small scale fishers. The objectives of the training were to enable the two projects to set up their monitoring systems to align with the transversal M&E framework; identify practical ways for implementing the results frameworks at country level; increase synergies between the country and transversal level results frameworks in terms of indicators, data collection and reporting; improve communication and reporting on information generated by both the transversal and country-level M&E systems; and address M&E challenges faced by participants at country level. The transversal results framework will enable data to be collected to contribute to the measurement of the SDGs achievement at the impact level. The training enables the projects to appropriately measure the results of the intervention at output, outcome and impact levels. It also enables the two projects to increase their compliance with international standards and for project managers and their government counterparts to benefit from technical guidance and capacity development provided by the Transversal Project. The active involvement of government institutions in the implementation of the projects is crucial, only in this way can the impact of the projects be sustainable and integrated into government processes. The topics covered during the training included setting up M&E systems, types and attributes of good performance indicators, performance indicator tracking table (PITT), performance indicator reference sheets (PIRS), data flow and information sharing maps, M&E planning and resources. Sixteen participants from the Far Ban Bo (implemented by a consortium of Care International, Friends of the Nation and Oxfam), Far Dwuma Nkɔdo (implemented by Environmental Justice Foundation and Hen Mpoano), the Fisheries Commission of Ghana and FAO Ghana took part in the training. Participants indicated that the training was beneficial as it enabled them to revise the indicators of the results frameworks for the two projects to make them more measurable, accurate, non-directional and cost-effective. The knowledge acquired will be used to improve the projects’ results framework and implementation. On August 8, 2018, a ceremony was organized by FAO and the Code Rural to establish a technical committee to steer the process of elaborating a national land policy in Niger. The committee is composed of 44 representatives from diverse stakeholder groups such as key ministries, state services, civil society, private sector, notaries, mayors, traditional chiefs and technical and financial partners. The ceremony was presided by the Minister of State, Agriculture and Livestock, who is also the President of the National Committee of the Code Rural. In his speech, the Minister of State, Agriculture and Livestock reminded the members of the new committee that the elaboration of a land policy for Niger requires strong commitment and support from all in order to address all the tenure challenges and concerns of the country. The Minister explained that in the composition of the committee he has "opted for a multi-stakeholder approach in order to take into account the complexity and multi-sectoral and multi-user dimensions of land". Lastly, the Minister confirmed his strong commitment to accompany the elaboration process of Niger's land policy and to take the necessary decisions to ensure its success. 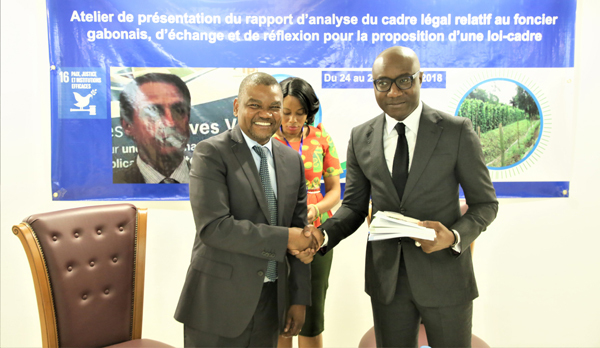 After the first VGGT workshop supported by FAO in Libreville in January 2015, Gabon engaged in a process aiming to undertake a comprehensive review of its national land legal framework. An assessment of the land-related legal framework has been ongoing for more than a year, in the context of the Technical Coordination Programme (TCP) currently being implemented in central Africa. 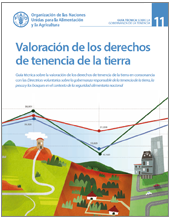 With the support of FAO’s Land Tenure Unit and Legal Office and also incorporating the results of complementary studies led by a sociologist and a geographer on customary tenure systems, two legal consultants conducted this assessment and prepared a zero draft of a general land law. 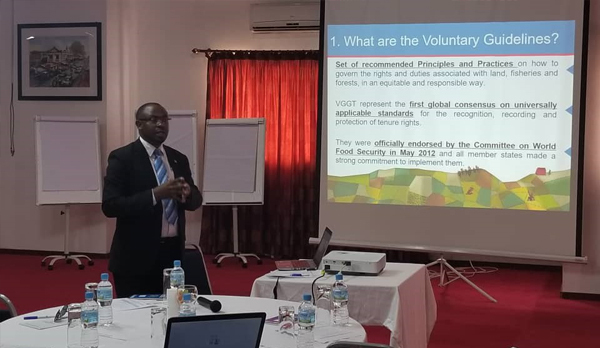 The results were presented, discussed and validated during the second national VGGT workshop, which took place from 24 to 26 October 2018 in Libreville. During this event, representatives from government, civil society and academia underlined the importance of officially recognizing customary rights, including those of indigenous peoples and of adding stipulations that ensure better access to justice, in particular for the most vulnerable. The participants agreed on the need to have better legal and administrative procedures, to ensure gender equality and to strengthen consultation mechanisms in policy and decision-making, including considerations of Free Prior and Informed Consent (FPIC) principles and practices. They also highlighted the necessity to harmonize the legal framework with the PNAT (National Land Use Planning), still under development. Lastly, the main output of the workshop was the recommendation for the elaboration of a new general land law and the validation of the zero draft with the results from the three days of discussion. FAO’s support has been requested to further accompany the process and to support the legal drafting. 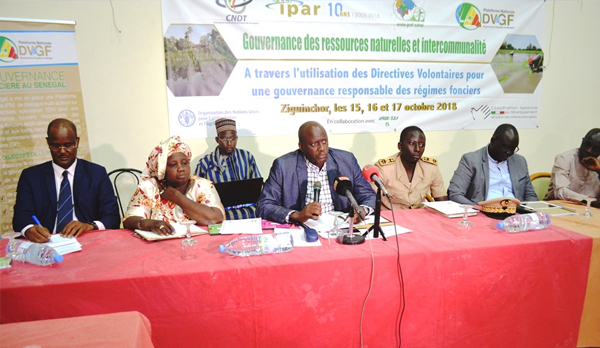 The multi-stakeholder platform for VGGT implementation and improvement of tenure governance in Senegal – established four years ago –contributed to the draft land policy document in 2016, and the new Inland Fishery Code in 2017. This year, it is engaging in forest tenure governance, thanks to support from the governments of Germany and Italy. This commitment employs a comprehensive and integrated approach to ensuring responsible forest tenure governance, in three action areas: capacity building of national actors, support to multi-stakeholder activities around governance of forest tenure and the development of tools and studies to support local authorities. A capacity building workshop was organized in July 2018 with the support of the Land Tenure Unit and the Forestry Division of FAO. It gathered more than 30 members of the multi-stakeholder platform. 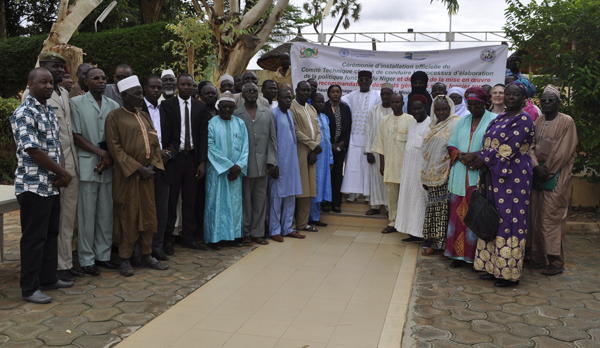 The session led to the establishment of a working group on the subject of governance, composed of the Directorate of Water and Forests, Hunting and Soil Conservation (DEEFCCS), the National Center for Forestry Research of the Senegalese Institute of Agricultural Research (ISRA / CNRF), the Union of Associations of Local Elected Officials (UAEL) of Senegal and the National Council for Consultation and Rural Cooperation (CNCR). Three main local consultation meetings were held in the Casamance region, the main forest area of Senegal. The National Council of Consultation and Rural Cooperation (CNCR), FAO’s partner in Medina Yoro Foulah department, supports two main activities. The first one, in August 2018, was a training workshop on forest governance. It brought together 45 local actors including the Technical Water and Forest Administration of the ministry, local elected representatives and civil society organizations. The second meeting was an exchange and awareness raising workshop organized in October 2018 with more than 50 local actors to discuss the main challenges in the region and to prepare a road map to tackle the issue of the international traffic of wood between Casamance and Gambia and deforestation caused by agriculture and conflicts between farmers and herders. The third meeting was held in the Ziguinchor region, with the support of the Agricultural and Rural Prospective Initiative (IPAR). A workshop on governance and inter-communality resource management was organized in October 2018. This workshop was chaired by the Minister Counselor Benoit Sambou, who is also the president of the National Commission for Territorial Dialogue (CNDT). The partnership with the CNDT is an opportunity to contribute to the definition of the outlines for inter-communality resource management, which will contribute to the implementation of the decentralization policy in Senegal. The period from August to mid-November 2018 was marked by the launch of initiatives to improve the governance of land and natural resources at local level. The first activity supported by ActionAid Senegal, consisted of the participatory development of a framework for identifying champions regarding land governance and management of natural resources. Once fully developed, this tool could complement the “civic certification of municipalities” process promoted by the Civil Forum, a civil society organization, which intervenes in the promotion of good governance. CNCR is also conducting participatory research work at municipality level of the Medina Yoro Foulah department. This initiative was inspired by a similar activity led by the Council of Non-Governmental Organizations for Development Support (CONGAD), which promotes the establishment of an extended public commission to civil society. 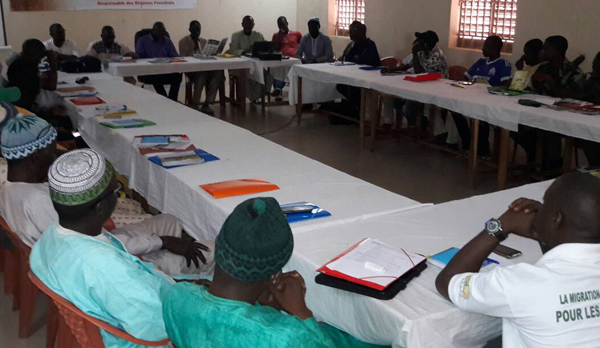 ISRA / CNRF and the Regional Development Agency (ARD) of Kaolack are supporting the Ndiago commune in updating its municipality development plan for the appropriation and practical support of land inclusion initiatives for vulnerable groups (young people and women). This work of institutionalization of governance priorities will be carried out on the basis of a new guide on local planning which will be sensitive to climate change, nutrition and gender, the fruit of a multi-stakeholder partnership at national level which includes the National Program for Local Development (PNDL), FAO, Ecological Monitoring Center, etc. This guide has already been tested in the municipality of Ndiago. More than 55 members of the Sierra Leone Parliament from the four oversight committees of Land, Agriculture, Forestry, and Fisheries participated in a training workshop on 3 October 2018 in Freetown to raise awareness on the VGGT and provisions of the 2017 National Land Policy laying the foundation for an informed discussion in Parliament on the proposed legislative reforms in the land, forestry and fisheries sectors. Discussing the proposed laws with knowledge of the VGGT will lead to a better understanding of the links between legal framework in the natural resources sector and the VGGT as an important element for shaping a well-functioning legal framework for the responsible governance of tenure, with particular focus on more vulnerable segments of society. In order to strengthen the capacities of the members of Parliament to better understand and advocate for more inclusive and gender responsive laws in the land, forestry and fisheries sectors, the training was conducted in collaboration with the Ministry of Lands, Housing and Environment (MLHE), the Ministry of Agriculture and Forestry (MAF), the Ministry of Fisheries and Marine Resources (MFMR) and the Sierra Leone Investment and Export Promotions Agency (SLIEPA). The one-day training was the first of its kind for new Parliamentarians since the general elections in April 2018 and was particularly important since the majority of the members are new in Parliament and are expected to legislate on issues related to land, forestry and fisheries in the country. The training was timely as Parliament is now in the process of reviewing and drafting new legislation to guide responsible governance of natural resources in Sierra Leone. The responsible management of these resources is critical in a country, such as Sierra Leone, where almost half of the population is food-insecure, and which is among the countries most vulnerable to the adverse effects of climate change and environmental hazards. The participants were also introduced to the new Agri-business Investment Approval Process (AIAP) that was developed in line with the VGGT. The MPs were informed on the various steps that must be followed to ensure Responsible Land-Based Investments in Sierra Leone. The AIAP provides a foundation on how investors can engage in Responsible Agricultural Investments. Honorable Quintin Salia-Konneh, the Chair of the Parliamentary oversight committee, challenged fellow Parliamentarians and the Government of Sierra Leone to prioritize responsible governance of land, forests and fisheries with sufficient budget allocations to the responsible Ministries, Departments and Agencies in order to ensure sustainability of all achievements registered through the implementation of the VGGT in Sierra Leone. 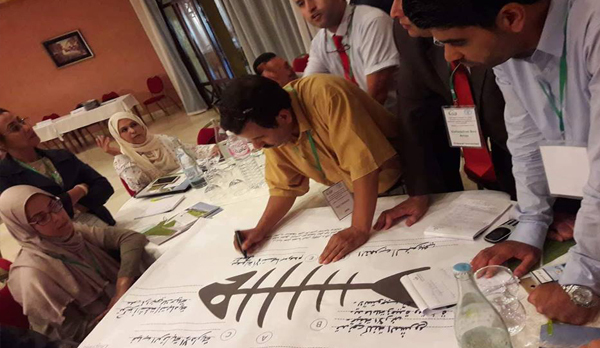 The second regional workshop to improve the management practices and approaches of the Agricultural Land Agency (AFA) in Tunisia was held in Tabarka (northern part of Tunisia) from 10 to 12 September 2018. The workshop, – organized by AFA in collaboration with FAO and funded by the SDC, – gathered AFA staff members as well as representatives from the Ministry of State Domains & Land Affaires, the Ministry of Equipment, Habitat and Land Planning, the Land Tenure Conservation, the Real Estate Court, male and female farmers, the Tunisian Agriculture and Fisheries Union, academia and local authorities. The workshop was characterized by interactive sessions and an important participation of women representing civil society organizations as well as state institutions in Tunisia. The 2-day workshop allowed participants to discuss the opportunities that the VGGT offer to find and propose solutions to resolve local tenure challenges, such as unsolved conflicts due to lack of clarity about property, overlapping tenure systems, cumbersome and expensive administrative processes, urban expansion on agricultural land, lack of coordination and information sharing at all levels. The workshop resulted in a set of recommendations, including: i) Strengthening of the coordination and information sharing between the various institutions and actors engaged with tenure; ii) creation of a high level body bringing together all relevant stakeholders; iii) revision of legislative texts; iv) gathering of all legal texts affecting rural areas in a Rural Code; v) update of titles to ensure consistency with the legal situation; vi) simplification of administrative procedures and reduction of administrative costs. The focus of work in the Mekong Region (i.e. 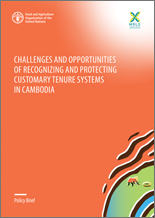 in Cambodia, Lao PDR, Myanmar and Viet Nam) is on the recognition of customary tenure and on safeguarding tenure when making responsible investments in agricultural and forested lands. These two subjects are interlinked, as many of the investments take place in areas where customary tenure prevails while not legally recognized. The work is executed in coordination with the Mekong Region Land Governance (MRLG) project, and it is supported by the Swiss Agency for Development and Cooperation (SDC). The FAO Learning Programme based on the VGGT Technical Guide "Safeguarding Land Tenure Rights in the Context of Agricultural Investment” shows how government authorities, involved in attracting and managing agricultural investments, can promote socially responsible and financially sustainable investments that benefit communities, investors and society as a whole. 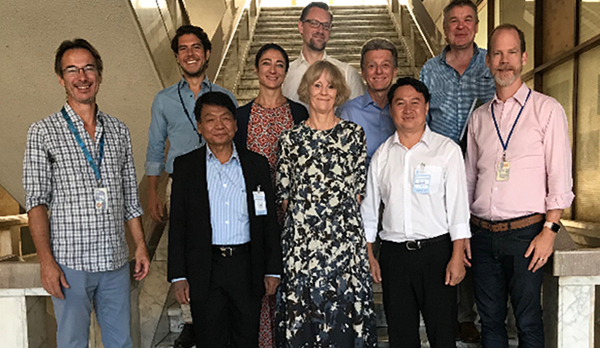 From 11 to 14 September 2018, the team rolling out this Learning Programme in Lao PDR and Myanmar met at FAO headquarters in Rome. The purpose of the meeting was coordination with other projects and programmes dealing with tenure and responsible investments in the two countries, and tailoring of the contents of the Learning Programme to the respective country context. Colleagues from FAO’s Capacity Development Unit leading the work met with the CFS-RAI team, Land Tenure Unit, Legal Office, and Trade and Markets Division. The two National Coordinators, Messrs San Thein and Sengthong Soukhathammavong, of Myanmar and Lao PDR respectively, furnished inputs to assist in tailoring the Learning Programmes to the respective country context. A visit to Myanmar was made from 24 to 28 September 2018 to promote participation in the Learning Programme. 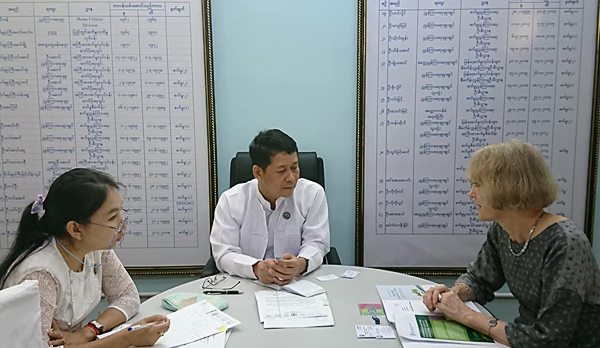 Various Ministries and Departments were visited, among which the Ministry of Agriculture, Livestock and Irrigation and the Ministry of Natural Resources and Environmental Conservation closely involved in mainstreaming the VGGT in Myanmar. 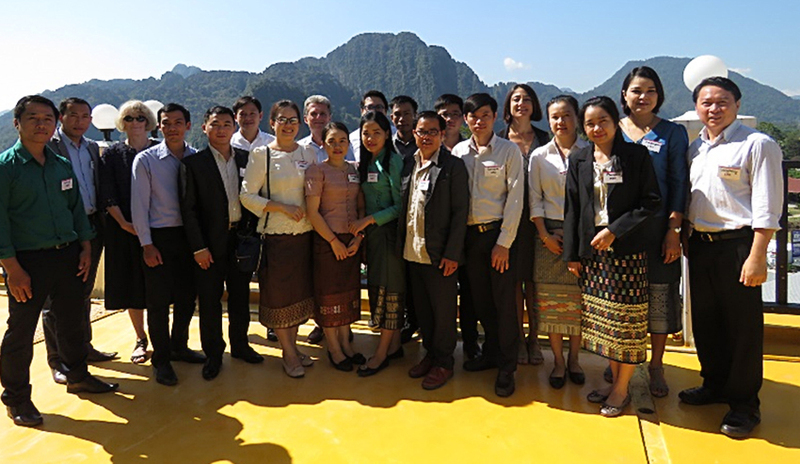 Furthermore, the Ministry of Commerce, Ministry of Industry, and the Myanmar Trade Promotion Organization were visited. The Land Core Group and Landesa were paid a visit to coordinate activities related to safeguarding tenure rights for the vulnerable and marginalized in the context of the promulgated National Land Use Policy. Rollout of the online course in Myanmar started on 22 October 2018 with 38 participants. On 1 October 2018, the rollout of the first phase of the Learning Programme in Lao PDR, i.e. the multi-session instructor-led online course in Lao language, started with a kick-off meeting in Vientiane in the presence of 14 of the 20 participants. Guided by tenure experts, participants will work online (at their own pace) to further develop their understanding of the basic principles of responsible investments in agriculture as set forth in the VGGT and apply those principles to the Lao context. The participants familiarised themselves with the platform by navigating through the different lessons, documents, quizzes, and tests. The online phase was followed by the face-to-face workshop, held from 5-8 November in Vang Vieng with 16 participants who successfully completed the online phase. The workshop expanded and built on issues highlighted in the online phase to consolidate the knowledge acquired. 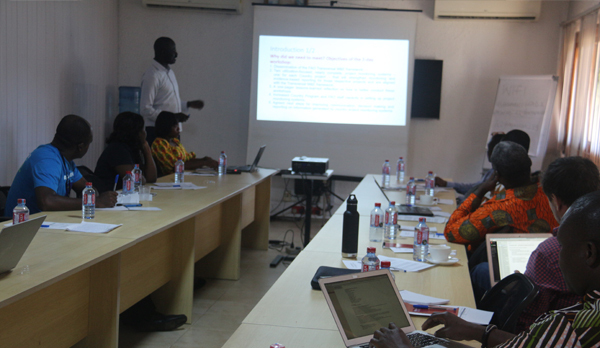 Subjects covered in the workshop comprised identification of benefits and risks related to agricultural investment, mapping of government stakeholders, and business models that foster responsible agricultural investments. The latter was illustrated by presentations of the models used by two private sector companies, i.e. Stora Enso and Saffron Coffee. Participants analysed the investment approval process in Lao PDR with particular attention to consultation and participation, and the social and environmental impacts of an investment. They also practiced how to deal with the operation of an investment project and process. The workshop ended with the identification and prioritization of actions that may be implemented to achieve more responsible agricultural investments. Participants showed great appreciation, not only for the contents of the Learning Programme, but also for the different formats used that were new to them. In Lao PDR, progress is also being made in the process of the draft Land Law. A meeting of the Land Law Advisory Group, of which FAO is a member, with the Institute for Legislative Studies was held on 2 October 2018. The draft Land Law, revised by the Economic, Technology and Environment Committee, was forwarded to the Ministry of Natural Resources and Environment for further improvements in late October 2018. On 7 November 2018, an intersession seminar with National Assembly members took place in Vientiane. In this meeting the Land Law Advisory Group presented its recommendations for further improvements to the draft Land Law taking the perspective of international good practice as promoted by the VGGT. 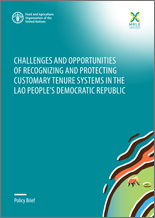 Four Policy Briefs have been developed to enable meaningful engagement and policy dialogue with government institutions and other relevant stakeholders about challenges and opportunities related to recognizing customary tenure in Cambodia, Lao PDR, Myanmar and Viet Nam. 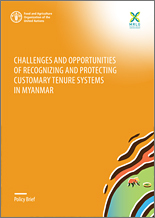 These Policy Briefs aim at strengthening the recognition and legal protection of customary tenure systems in the respective countries in line with the key principles of the VGGT. The draft Policy Briefs were presented and discussed at the MRLG-FAO Mekong Regional Land Forum, held from 28 to 30 May 2018, in Bangkok. Feedback from representatives from the four countries has been considered in the final versions of the four Briefs. The development of the briefs was led by the FAO Regional Office for Asia and the Pacific in collaboration with MRLG, and supported by the Regular Programme. 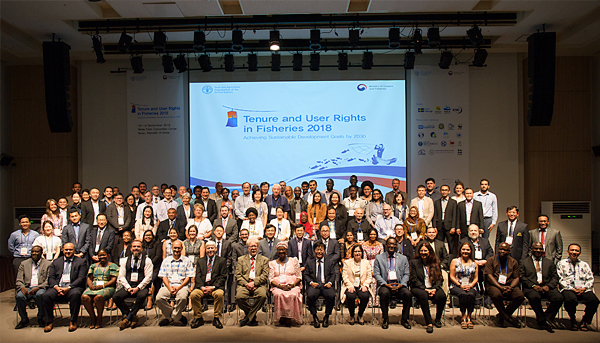 Tenure and user rights have a very important yet contentious history in the capture fisheries sector, so fisheries stakeholders from 42 countries came together in September to share knowledge and to increase their understanding of fisheries tenure and user rights at the FAO UserRights 2018 conference in Yeosu, Republic of Korea. Marine and inland fisheries provide millions of people around the globe with food security and livelihood opportunities with approximately 1 in 10 people on the planet relying on fisheries and aquaculture for their livelihoods. However, if capture fisheries are going to be sustainable, it is vital to clarify tenure and secure access to these finite but renewable natural resources. Advancing knowledge on how the world’s marine and inland capture fisheries are accessed, used, and managed using various types of rights-based approaches is a crucial step towards achieving many of the SDGs and attaining food and nutrition security, livelihood and lifestyle benefits. The 166 UserRights 2018 participants (68% male, 32% female) shared 74 case studies covering tenure and user rights in fisheries in 45 countries. Participants from around the world came from governments (36%), non-government organizations (NGOs) and intergovernmental organizations (IGOs) (30%), academia (20%), cooperatives (10%), and others (3%). Links are now available to the two main outcomes and to all of the case study presentations. The UserRights 2018 conference proceedings including written summaries of all of the keynote presentations, discussions, case studies, the way forward and recommendations – will be available in the first half of 2019. The current website will also be expanded to provide key resources for managing tenure in fisheries, information from past fisheries tenure meetings, and will host an on-line repository of case studies of fisheries tenure around the world – starting with participants’ contributions to UserRights 2018. Based on a questionnaire and a case study template, the information will be made available in a searchable format for future analyses and studies. UserRights 2018 participants called for the development of Voluntary Guidelines on Fisheries Tenure and User Rights to address the complex marine, inland, commercial, small-scale / artisanal, indigenous and gender-related fisheries issues that make fisheries tenure and user rights unique. Stand-alone guidelines will enable stakeholders to address the complexities and challenges faced in managing fisheries. FAO is now working to mobilize resources for a global consultative process to gather inputs from fisheries stakeholders on the sort of content that should be addressed by such Voluntary Guidelines. Human well-being and the health of our planet depend on whether and how we grow and look after forests. So who gets to decide who owns and controls the forests and how - ‘forest governance’ - is profoundly relevant for all of us. This practical guide demonstrates how to take action in four critical areas – ‘understanding,’ ‘organizing,’ ‘engaging’ and ‘ensuring’- to improve decision-making about forest goods and services and describe how practical tools can be used to shape better governance of forest tenure. The guide is also available in English, French, and Spanish. The VGGT recognize the complexities of effective land administration associated with the delivery of tenure-related services, specifically referencing the importance of valuation. This guide sheds light on the issues associated with the identification and valuation of tenure rights for different purposes, and provides guidance on how to ensure that valuations are undertaken in a fair, reliable and transparent manner that complies with international norms. The guide is also available in English. Coming soon in French and Russian! 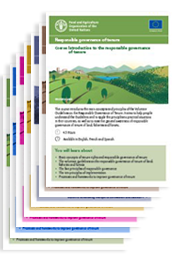 The French and Spanish translations of the Policy Guidance Note on Land Tenure are now available on the Policy Guidance Notes website! 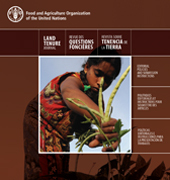 The brief provides background information on tenure, food security and nutrition linkages and addresses the overarching question of what changes are needed to existing tenure-related policies and laws to improve the attention given to food security and nutrition concerns and raise the profile of tenure issues in the food security and nutrition agenda. These policy guidance notes have been produced in the frame of the strategic partnership between FAO and the Directorate-General for International Cooperation and Development (DEVCO) of the European Commission to boost food and nutrition security, sustainable agriculture and resilience. A new Technical Guide is under development on ‘Tenure and Regulated Spatial Planning’ in support of implementation of the VGGT. This guide aims at presenting spatial planning and tenure as an opportunity to strengthen democratic spaces in line with the VGGT principles, taking into account that regulated spatial planning is an area with high potential for unequitable value capture due to its regulatory function. TMG Research gGmbH organised a workshop to further develop the guide in Berlin, from 8 to 10 October 2018, gathering 17 experts from across the globe. The selected approach sets this Technical Guide apart from already existing guides on the same subject. It does not identify the already well-known steps for spatial planning procedures. Rather, it moves the discussion on a normative level, as the approach reinforces the notion of conducting spatial planning along the principles of the VGGT. Experience on the ground shows that spatial planning processes often do not sufficiently consider the elements of access to justice, access to information, accountability and meaningful participation, and the implications especially for marginalized groups. The workshop served to kick start the process of drafting strategies to strengthen democratic spaces through spatial planning. The following months will be dedicated to drafting these in more detail. The Federal Government of Germany is supporting the development of this Technical Guide. We are currently looking for good quality articles bringing in globally or regionally important experiences and best practices related to tenure, lessons learned in the implementation of VGGT by FAO and its partners, emerging tenure issues and cross-cutting themes and proposing ways forward to meet challenges that the land and natural resources tenure sector is facing.